At Project Rachel, there are people with whom you can talk in confidence about your experience. You will not be condemned for your decision. Our trained volunteers will help you deal with the trauma of your experience, start you on the path to healing and help you to accept God’s forgiveness, your baby’s forgiveness and forgiveness of yourself. Call or email Project Rachel today. 859-392-1547 or [email protected]. All calls and emails are confidential. Are you experiencing Post-Abortive Stress? Have you changed as a person since your abortion? Has your relationship with men changed since your abortion? Do you avoid intimacy? Do you struggle to turn off feelings connected to your abortion? Do you find it stressful to be around babies or pregnant women? Do you feel sad, depressed or sick around the anniversary date of your abortion? Is it difficult to talk about your abortion experience? Are you over whelmed with guilt? Are you experiencing a substantial increase alcohol use or drug use? If you have a child now, do you fear for them and smother them with love or over-protection? Is project Rachel a program for only Catholics? No, Project Rachel is for people of all faiths and backgrounds-everyone is welcome. the program is based on the tenets and teachings of the Catholic faith. No one will be forced or coerced into changing their beliefs. The program is designed to help women who have experienced an abortion. Will I be forced to speak or tell my story in front of others? No, you will not be forced to do anything that makes you feel uncomfortable. The program encourages women to share, but this is not an obligation. 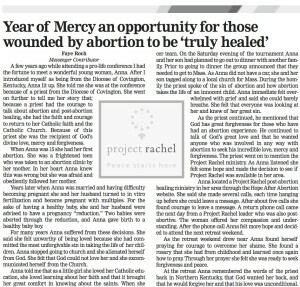 Project Rachel is a safe haven and allows women to experience the healing process at their own pace. The format is a small group with two leaders and generally the session run 8 weeks, additional time can be taken if needed. Will my name and privacy be kept confidential? Yes, Project Rachel overwhelmingly respects the confidentiality of its participants and will respect your utmost privacy in all matters related to the program. Confidentiality is a key part of the program. Are women really helped from the program? Yes, Project Rachel does help women tremendously. Countless participants have experienced healing and forgiveness they did not think would ever be possible. The program and ministry is absolutely free of charge to participants.